Michael’s Coolwood’s PR person got in touch with me to ask if I’d like to review his book. I said (to myself) I really wouldn’t. Then I went and took a little look at Mr Coolwood on YouTube and changed my mind. I’m still not quite sure why, except he seems like a nice chap with a Pythonesque sense of humour and that swayed me. So they sent me a book – that’s a disclaimer by the way, I didn’t buy my copy. I’m also not selling it on Amazon, because that is churlish. I’m glad I changed my mind. Coolwood’s back cover blurb mentions Terry Pratchett, PG Wodehouse and Douglas Adams as his literary diet, and it’s very evident that he’s definitely been well-fed. 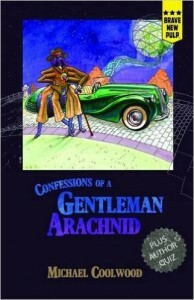 Confessions of a Gentleman Arachnid is Wodehousian in everything but its location. The duffer ( Milligan Clodthorpe) has a clever valet, a somewhat frenetically insane cousin, a good friend who is nearly as dufferish as himself, a gruff uncle and an awful aunt. Sound familiar? Well, yes, except Milli is an arachnid, his valet is mechanical, his good friend is in a portable coffin and he’s about to end up in the body of a human female when a dastardly colleague swaps bodies with him overnight (okay, that’s complicated, you need to read the book yourself) and leave him in a pickle. With somebody else’s body, no transport and little ability to think coherently, Milli relies on his good breeding and excellent sense of honour to get him through some tough scrapes in pursuit of his eight-legged grail. It’s quite delicious nonsense, especially Milli’s ability to misquote and misremember just about every already hackneyed quotation ever dragged kicking and screaming out of its context. And if it all sounds too frothy, there are some serious matters being debated in a lighthearted fashion, including: how a limited war might actually work – basically, don’t let any humans in on it, they’re too psychotic; the philosophical positions around immortality if the immortal part is consciousness not physical form and, an interesting sub-plot about identity and choice which strongly reflects back on the main plot. I thoroughly recommend it if you’re a Wodehouse fan, if you like British humour and if you aren’t overly disturbed by spiders!